The United States' official gold bullion coin, the Gold American Eagle, was first released in 1986. Today, it comes in tenth-ounce, quarter-ounce, half-ounce and one-ounce forms. The one-ounce is the most valuable, carrying a nominal face value of $50 and comprising 91.67 percent fine gold. The Gold American Eagle was authorized by the Gold Bullion Coin Act of 1985 and is now one of the world's most popular gold bullion coins. 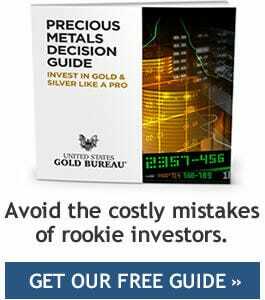 The U.S. government guarantees that each coin includes the amount of actual gold weight, in Troy ounces, on the back of the coin. Though predominantly gold, the coin is much more wear-resistant than coins with a gold purity of at least 99.9 percent. This strengthening is due to the addition of copper and silver, which helps make it more resistant to scuffs than other bullion. The gold, as required by law, originates from sources in the United States. The coin's obverse depicts the full-length figure of Lady Liberty. Her hair is flowing and she holds in her right hand a torch. In her left hand she holds an olive branch, a traditional symbol of peace. The Capitol Building, home to the United States Congress, can also be seen in the background to the left. This design actually debuted on the Saint-Gaudens Double Eagle coin. This $20 gold coin was struck by the U.S. Mint between 1907 and 1933 and takes its name from Augustus Saint-Gaudens, the sculptor who was originally responsible for the design. That coin has often been considered among the most beautiful U.S. issued coins, making this Liberty design an obvious one to revive in 1986. The Gold American Eagle's reverse design comes instead from the monumental sculptor Miley Tucker-Frost. It portrays a male eagle clasping an olive branch as it flies above a nest with a female eagle and two hatchlings. A bald eagle is iconic as the national bird of the United States. In most instances, the face value of a Gold American Eagle is proportional to its weight. For example, while the $50 coin weighs 1 Troy ounce, the half-ounce coin has a face value of $25 and the tenth-ounce coin is $5. The only exception to the rule is the quarter-ounce coin, which carries a face value of $10, rather than the $12.50, that would typically be expected. The $50 coin - which actually weighs, to be specific, 1.0909 Troy ounces, is the most popular size among Gold American Eagle bullion coins. A weight of 1.0909 Troy oz.